Former Lance Cpl. Dayna Morales, a restaurant server, left her job following claims that her viral story about an anti-gay message from a customer was a hoax. A former lance corporal-turned-waitress is out of a job and returning donations she received from strangers following questions about her claim that she received an anti-gay message from a customer in place of a tip in November. Dayna Morales, a former administrative specialist with Marine Air Group 49, no longer works at the Asian restaurant where she claimed to have received a negative message from a customer about her sexual orientation, according to ABC News. The restaurant owners posted an update to their Facebook page calling the situation unfortunate. The results of their own investigation were inconclusive, they wrote, and that the decision to part ways was a mutual one. Weeks later, though, a couple stepped forward claiming the photo of the receipt she posted that day was doctored. 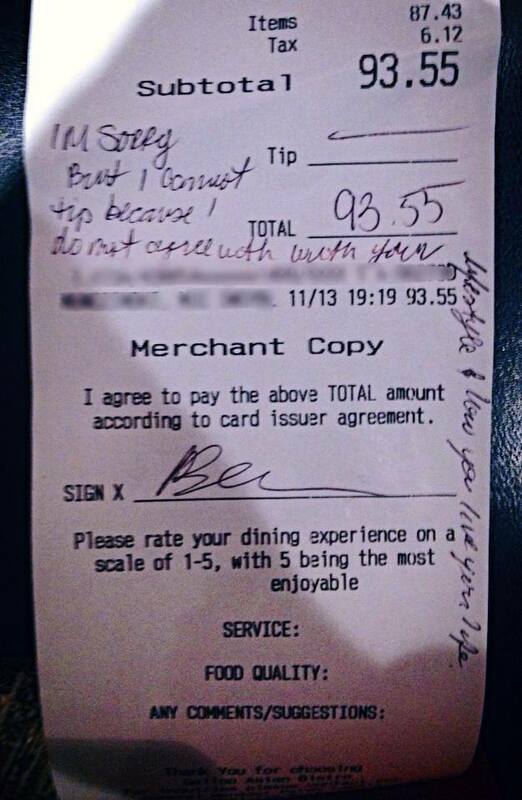 They claimed to have left her a 20 percent tip and said they didn’t write any anti-gay messages on the receipt. Morales had reportedly already received $3,000 in donations from people all over the country following her viral post on Facebook. They were meant to replace the tip she didn’t receive. Morales said she was planning to donate it to the Wounded Warrior Project, but LGBTQ Nation reported on Friday that the organization had no record of any contributions from the waitress. Some of those donations have been returned via PayPal, ABC reported, while others who gave money in person or by mail are still awaiting refunds. She gives us lonely LCpl’s and Marines in general a bad name. But you have to hate the sin and love the sinner. She should apologize publically, get mental health treatment, and pray for her own soul……..
What a disgrace to herself, the LGBT community, and especially the Corps. Some people. ..
Elaine you are so right. Sounds like she needs more than just a little bit of mental health treatment too. Its pretty clear, unrepentant homosexuals shall not inherit the kingdom of God. Nor sure how people who claim to be Christians can deny these facts. Nice story quotes there, Nygaard. Meaningless. Morales is a disgrace. That is all. Lets move on. People who claim to be Christians can deny these “facts” with the same line of reasoning that allows them to deny the “fact” that women who lie about their virginity should be stoned to death. “But if this charge is true, that the girl was not found a virgin, 21 then they shall bring out the girl to the doorway of her father’s house, and the men of her city shall stone her to death because she has committed an act of folly in Israel, by playing the harlot in her father’s house; thus you shall purge the evil from among you,” (Deut. 22:13-21). The cultural context has changed from when the bible was written. Stoning women is now discouraged in most societies. If that is reason enough to ignore certain parts of scripture, certainly the changing cultural context in which modern-day attitudes towards sexuality are held would warrant equal revision. Nygaard, how do you treat a person who asks for forgiveness after each homosexual act? You clearly state that unrepentant homosexuals will not go to heaven, so if I were a homo and asked for forgiveness, then I’ll go to heaven? Also I saw thieves in that list, so do you ask for forgiveness when you “fudge” on your taxes? when you lie to the cop to get out of a ticket? Sorry, but your poop stinks just like every one else’s. B. Stu makes some good points also, I bet your cherry was long gone before your wedding night?